Program “Urology” – a complex approach to healthcare modernization, based on the example of Voronezh region Apolihin O.I., Sivkov A.V., Katibov M.I., Schukin A.V., Zolotuhin O.V., Shaderkin I.A., Madykin Yu.Yu., Kocherov A.A., Kocherova E.V., Shaderkina V.A., Prosyannikov M.V., Voytko D.A. Analysis of morbidity and mortality from uronephrological diseases in the Russian Federation in 2010-2011 Apolihin O.I., Sivkov A.V., Moskaleva N.G., Solnceva T.V., Komarova V.A. Statistics and risk factors for urolithiasis in Belarus Voschula V.I., Nitkin D.M., Lelyuk V.Yu., Gaponenko A.D., Schaveleva M.V., Yuraga T.M., Vladimirskaya T.E. Comparative study of the spermatogenesis in rats following a course of treatment with phosphodiesterase type 5 inhibitors Efremov E.A., Efremov G.D., Kirpatovskiy V.I., Lugovskoy A.S., Radnaev L.G., Krasnyak S.S., Kulikov A.O. Comparative study of prostatotropic effects of coniferous provitamin concentrate and extract of Serenoa repens based on the model of benign prostatic hyperplasia in rats Bespalov V.G., Murazov Ya.G., Kuzhanov A.A., Semenov A.L. Experimental cytotoxic affection prostate in the modeling of chronic prostatitis Horosh V.Ya., Mysak A.I. The role of the hormonal factors and blood supply disturbances of the prostate in the pathogenesis of the benign prostatic hyperplasia Kirpatovskiy V.I., Mkrtchyan K.G., Frolova E.V., Kazachenko A.V. The question of the PDE-5 inhibitors selection: efficacy and safety Tevlin K.P., Bruk Yu.F. Preferences of the patients in terms of alpha-blocker choice during the treatment of BPH-induced voiding dysfunction Vishnevskiy A.E., Luk'yanov I.V., Markov A.V. The characteristics of the prostate and gonadal microcirculation in the adolescents with isolated varicocele and varicocele with the pelvic congestion Neymark A.I., Popov I.S., Gazamatov A.V. Risk factors for the development of the urolithiasis in patients with the metabolic syndrome Gusakova D.A., Kalinchenko S.Yu., Kamalov A.A., Tishova Yu.A. 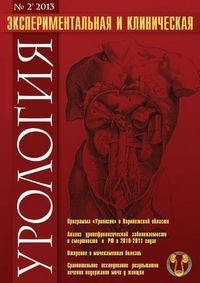 Obesity and urolithiasis Konstantinova O.V., Katibov M.I., Yanenko E.K., Kalinichenko D.N., Gecaev T.K. Influence of the body mass index on the outcomes of the percutaneous nephrolithotripsy in patients with large and staghorn stones Chernyshev I.V., Merinov D.S., Pavlov D.A., Fatihov R.R., Epishov V.A., Artemov A.V. Oxalate metabolism and the role of oxalobacter formigenes in the development of urolitiasis Shestaev A.Yu., Paronnikov M.V., Protoschak V.V., Babkin P.A., Gul'ko A.M.
Extracorporeal and contact ureterolithotripsy in the treatment of big stones in upper third of the ureter Martov A.G., Gordienko A.Yu., Moskalenko S.A., Penyukova I.V. Capabilities of the neoadjuvant and adjuvant hormonal therapy in the combination treatment of the prostate cancer Grickevich A.A., Mishugin S.V., Rusakov I.G. A first experience with the endoscopic extraperitoneal radical prostatectomy after transurethral enucleation of the prostate Kochkin A.D., Sevryukov F.A., Sorokin D.A., Karpuhin I.V., Puchkin A.B., Semenychev D.V. Focal cryoablation of the prostate Govorov A.V., Vasil'ev A.O., Pushkar' D.Yu. Predictive value of blood eosinophils and lymphocytes in the treatment of the urological infections Ivaschenko V.V., Kirpatovskiy V.I., Golovanov S.A., Chernyshev I.V., Perepanova T.S. Combination therapy of the urogenital infections in men Popov S.V. Comparative study of the treatment results using mesh prosthesis in women with urinary incontinence Kachmazov A.A., Romih V.V. Hydronephrosis treatment: from nephrectomy to NOTES technology Minin A.E., Kagancov I.M., Turabov I.A. A longtime stay of the foreign body (needle) in the urethra and soft tissues of the perineum in a 10-year boy Nurmuhamedov K.N., Radzhabov U.A.